JJanette Berrios is a marketing director of Symphonic Distribution, a digital music distributor based out of Tampa, FL. 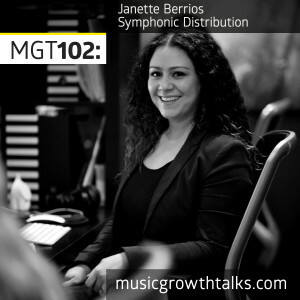 Positioning itself as a “One Stop Shop for the Music Industry”, Symphonic does more than distribution though, and Janette explains how the company helps their clients on this Music Growth Talks podcast episode. What Janette also talks about in detail is how to communicate about your releases with whatever distributor you’re using in order to be considered for a feature by online music retailers and streaming platforms. Learn what kind of information to submit and by when, what factors may help you in getting exposure, etc. And of course, this episodes is full of insights on Spotify! From appearing on Spotify-owned playlists to the platform’s hidden features and getting the most out of Spotify for Artists, Janette covers it all. Listen to the show in full to get yourself closer to getting a major Spotify feature.